Brixton 2013 by Camila Cardeñosa. Weathershield. Explore the history of the Brixton Windmill and the Ashby family who built it. Located near Brixton Windmill this thirty-one metre mural brightens up the playground in Windmill Gardens. Designed and painted by Camila Cardeñosa with the help of the local community the mural documents the history of the windmill in images and quotes. The mural emerged out of the Hands on Windmill Gardens project, initiated in October 2012 by Camila, a Brixton resident and graphic designer. The aim of the project was to create a sense of ownership among local residents, help visitors engage with the history of the windmill and visually improve the playground area of the park. The project was launched in close collaboration with Lambeth Council, the local community group Friends of Windmill Gardens and the Heritage Lottery Fund , which has funded the restoration of the windmill in 2010. Camila and Stephen Lawlor, Education Officer for the Brixton Windmill, designed the mural with input from the local community. Several workshops were conducted with children and adults to choose fonts, imagery and text documenting the story of the miller and the windmill. About 250 people were involved in the design, including children from Sudbourne, Holy Trinity, Jubilee and Orchard Primary schools, Holmewood Nursery and Brixton Scouts Group, as well as residents of the Windmill Lodge Care Home. Educational sessions were held for schoolchildren to learn about the customs of Victorian England and the the Ashby family, who built the windmill in 1816. The mural was painted throughout April 2013 by Camila with the help of volunteers. In order to give youngsters the chance to participate in the painting of the mural the parts closer to the ground were designed to be more detailed. Over four weeks 200 people painted the mural in 336 hours, using fifty paint brushes. The mural was unveiled on the 6 May 2013 as part of the windmill's annual Mayday festival. The mural is in good condition however the application of an anti-graffiti coat seems to have damaged it. The mural can be found off Brixton Hill in Windmill Gardens, a small park on the west end of Blenheim Gardens. Windmill Gardens can also be accessed from Ramillies Close, off Lyham Road. 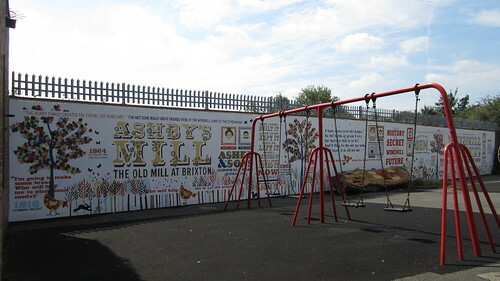 The mural is located on a wall behind a playground adjacent to the Brixton Windmill.